Our computer network installation tool kit has 4 1⁄2” diagonal cutting pliers and a 2-in-1 reversible screwdriver to help with network adapter installation, network cable repairs, and network testing. This networking tool kit also comes with a RJ11/12/45 modular plug crimper with a wire cutter and stripper, a punch down tool with 66 &110⁄88 blades, a UTP/STP cable stripper, and utility knife to help with computer network installation. These tools are Pro Grade, comparable to Klein or Leviton. Lastly, this tool kit comes with a LAN cable tester to ensure that your finished cables are fully operational. All of the tools will arrive inside a molded plastic hard case to keep them all together, neat, and organized. The Network Tool Kit allows the professional installer or amateur enthusiast to handle cabling, terminating and troubleshooting with ease. 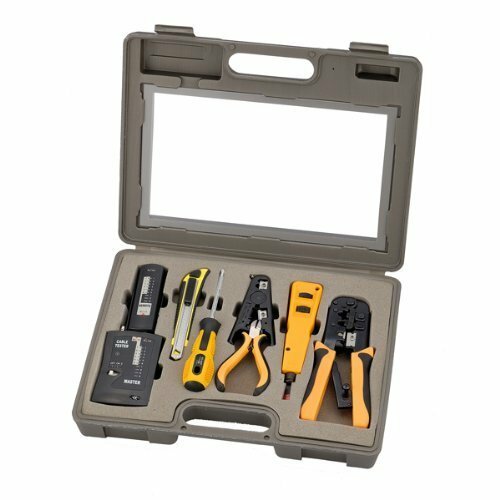 From crimping to cutting, with the crimp tool and cable stripper, to “sniffing” out problems with the compact LAN cable tester, this kit has everything you need.